NEW BRITAIN, Conn.--(BUSINESS WIRE)-- Stanley Black & Decker (NYS: SWK) today introduced a new brand identity for its STANLEY® branded products, services and businesses, modernizing one of the most recognizable brands in the world. The new brand identity exemplifies the STANLEY® 170-year reputation for innovation, quality and performance. 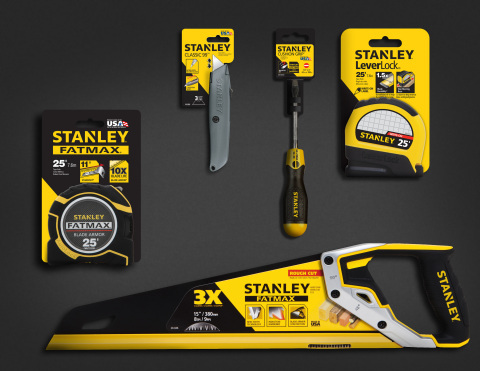 "STANLEY® has undergone a tremendous transformation in the past 15 years," said John F. Lundgren, Chairman & CEO. "The brand now participates in a vast array of markets, from Healthcare and Security to Engineered Fastening and Oil Pipeline Services to Hand Tools and Power Tools. We wanted a logo that truly represented the size and scope of the brand." Lippincott, a global brand strategy and design consultancy, worked extensively with STANLEY® employees, customers, end-users, and other key stakeholders to research, encapsulate and distill the STANLEY® brand essence. To translate the new brand positioning "Performance in Action" into its subsequent visual identity, Lippincott sought to balance STANLEY's rich heritage while signaling its ever-expanding product and service portfolio. For the logo that meant a more dynamic gesture by freeing the STANLEY ® name from the holding shape while maintaining the "notch" concept by applying an angular cut to the letter "N' in the center of the word. The resulting shape is an upward arrow-like triangle that speaks to the concept of "Action," given the simplicity of the triangle that is developed with a single cut. In the spirit of building on STANLEY's brand equity, the logo maintains its signature yellow and black palette. "Through our research and creative work with Lippincott, we were able to mine the common core of all of our STANLEY ® branded products and businesses," said James M. Loree, President & Chief Operating Officer. "That common thread is excellence in performance. Whether it is the tool a professional relies on, a security system that a school relies on, or a pipeline service that an industry relies on, STANLEY ® means performance." The last time the company modified the STANLEY® logo was 1995, continuing an evolution that has progressed for nearly two centuries. "In 170 years, we've had three basic logos," said Scott Bannell, Vice President of Corporate Brand Management. "I believe that this new logo has the strength and power to carry us for decades to come." High resolution images of these graphics may be found in the "Investors" section of the company's website at www.stanleyblackanddecker.com. The article Stanley Debuts New Brand Identity originally appeared on Fool.com.